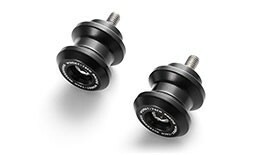 These swing arm spools look great with their anodized coating and feel sturdy enough to get the job done. Advantages: Works great with my pit bull rear stand and I'm sure it would work great with any rear stand. Disadvantages: Obviously the anodizing gets galled up when putting your bike up on the stands but they're doing what they were intended to do. It just takes away from the overall aesthetic when they get beat up. These things are pretty sweet. They are very thick and sturdy. They do not feel cheap at all. The finish is beautiful. Don’t know how long the finish will last but I think a long time. Advantages: Very sturdy. Looks very premium. Disadvantages: Let’s me use my stand so I can work on my bike which also makes me spend my money. Hey but TST makes great products so I don’t mind throwing it their way.